Few readers will be aware of the ‘Elizabeth Linnaeus phenomenon’ today; yet over a span of almost two hundred years botanists, gardeners and scientists speculated about it. Elizabeth was the eldest daughter of the famous botanist, Carl Linné, known as Linnaeus. One evening in the early 1760s, she was enjoying her father’s summer garden at Hammarby, near Uppsala, Sweden. She noticed how the “yellow … brilliant” flowers of the nasturtium appeared to gleam unexpectedly brightly in the half-light: so much so that they appeared to be emitting flashes or sparks. So confident was she in her repeated observations that she shared them with her learned, botanist father and other philosophers and in particular with the celebrated electrical expert, Johan Wilcke. The latter concluded that the scintillations could be “related to ubiquitous Electric materials”. 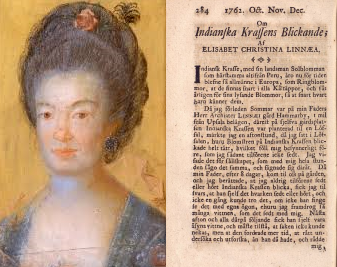 Although she was only nineteen, Elizabeth published her findings in an article entitled “Om Indianska Krassens Blickande” (“On the twinkling of Indian Cress”). This was recorded in the Acts of the Royal Swedish Academy of Sciences for 1762. And on its damask eyelids pour the light. In the footnotes to this stanza, Darwin explains the scientific basis (as he saw it) of the influences of heat, “scintillating” light and electricity upon “vegetative realms”. This was directly influenced by Elizabeth Linnaeus and her ‘flashing flowers’. 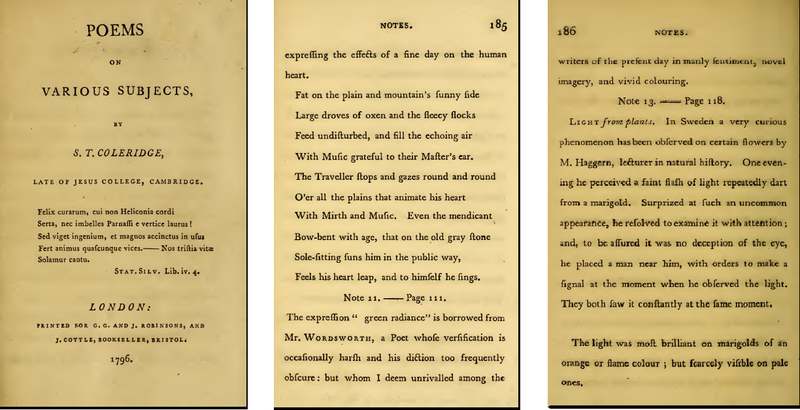 In the autumn of 1793, Darwin’s poems and William Wordsworth’s newly published ‘An Evening Walk’ and ‘Descriptive Sketches’ were the subject of “a good deal of literary & critical conversation” between Samuel Taylor Coleridge, Wordsworth’s brother Christopher Wordsworth, and their university friends at Cambridge. It was thus by means of Darwin’s poems that Elizabeth Linnaeus’ observations reached the pioneers of English Romanticism. Botany and Natural History had both a scientific and homely appeal to Wordsworth and Coleridge, because they could be enjoyed by all – men, women and children alike. Yellow and gold flowers would never seem quite the same again, having acquired mysterious qualities of vitality, light and electricity. Likewise light was now associated with electricity and took on a special significance for them, sometimes symbolic of Love, as in Wordsworth’s ‘Among all lovely things my love had been’ (also called ‘The Glow-worm’) of 1802 and Coleridge’s ‘A Day Dream’, stanza 3, of the same year. Shoots rapid thro’ the frame! Coleridge appended an end note to the poem which he reproduced substantially from Darwin’s Supplement to The Loves about the flashing flower. Clearly, Coleridge was drawing on the electric effect described in Elizabeth Linnaeus’ article of 1762. I miss the sun in heaven, having been on a short allowance of sunbeams these last ten days; and if the nervous fluid be the galvanic fluid, and the galvanic fluid the electric fluid, and the electric fluid condensed light, zounds! What an effect must these vile, dark, rainy clouds have on a poor nervous fellow, whose brain has been in a state of high illumination for the last fifteen months! Not only did the flowers “flash” but “Out-did the sparkling waves in glee”. 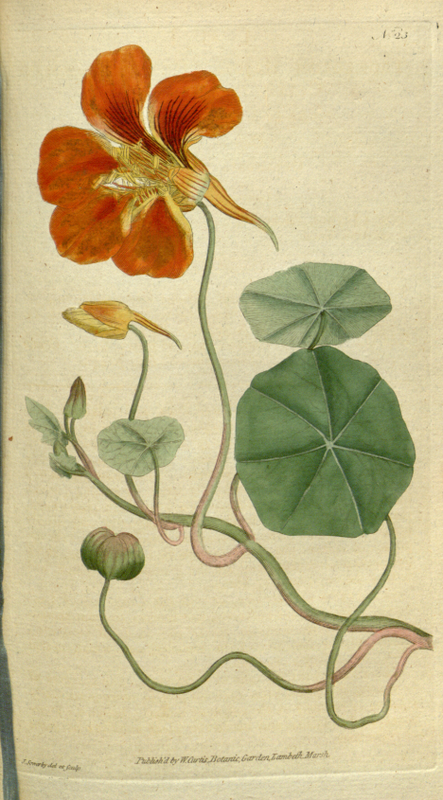 These golden, flashing and dancing flowers, recorded also as “ever glancing” in Dorothy’s journal entry, appear to have been derived directly from Elizabeth Linnaeus’s description of her “yellow … brilliant” nasturtiums as “blickande” (glancing or twinkling) and possibly affected by electricity. Elizabeth Linnaeus also “consider[ed] for a while that this [flash] might derive from a positioning of the eyes” rather than from electricity within the plant. Both Wordsworth and Coleridge came to the conclusion that the flashing effect was indeed in the eye, and not the flower. They became persuaded that the phenomenon was in the nature of an “Ocular Spectrum” or “After Image”. In 1810, the poet and scientist J.W. von Goethe had also questioned whether the flashing seen in flowers was actually in the flower or in the eye. Wordsworth later added a note of explanation about the “flash” to his ‘Daffodils’ poem in the 1815 printing: “The subject of these Stanzas is rather an elementary feeling and simple expression (approaching to the nature of an ocular spectrum) upon the imaginative faculty, rather than an exertion of it.” Coleridge later acknowledged grudgingly in his Literaria Biographia of 1817 that the concept of “visual spectrum” was indeed “a well known fact”, but at the same time he criticised Wordsworth’s lines about the “flash” as being “mental bombast”, inappropriate for describing the “joy of retrospection”. So what does modern science make of the phenomenon? In 1914, Professor F.A.W. Thomas wrote in the scientific journal, Nature, as that the “Flashing Flowers” (or “Elizabeth Linnaeus phenomenon”) really did exist, and that it was caused by an image of red light moving across the retina of the eye. In 1937, Professor M. Minnaert classified the same phenomenon as an “After Image”. In other words, it has been established that Elizabeth’s “flashing” was an effect within the eye, exactly as Wordsworth and Coleridge eventually came to believe. Fred Blick is an independent scholar from a multi-disciplinary background. He has published a number of essays over the past twenty years; not only “Wordsworth’s Dark Joke in ‘The Barberry-Tree’” in Romanticism journal in October 2014, but also innovative essays in peer-reviewed academic journals worldwide on the subjects of the Sonnets of William Shakespeare and of Edmund Spenser.